Read Any Good BLOGS Lately?!? This next weekend on Saturday October 4th from 10 a.m. until 5 p.m., I will be appearing at the Discovery World Museum in Milwaukee for STAR WARS DAY. Last year it was an amazing event supported by the 501st Legion of Star Wars Cosplayers (of which Denise and I are honorary members) and I know it will be again this year. 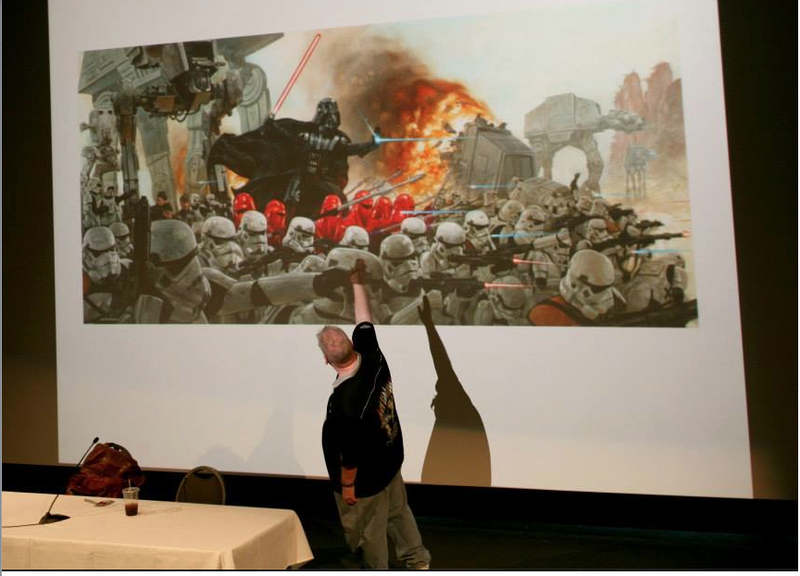 I will be doing two presentations, explaining my approach to creating my STAR WARS art in the theater there, and I hope you can attend one if you’re there. (No, Denise will not be with me this year – she has client obligations in Northwest Florida). Only a few writers showed true journalistic integrity and research this past week, and I applaud those who did. Rob Salkowitz of iCv2, Mat Elfring of Comic Vine and Heidi McDonald of The Beat are three that come to mind. I also appreciated the talented Gail Simone’s professionalism in her mea culpa, and her willingness to revisit the real story. In the end, I worry for the future of social media, the future of journalism, and I worry for the future of many readers out there who seem blinded to critical thinking. As our close friend, sometimes business partner and fellow artist Charlie Athanas said, “Oh, hive mind. We should all watch Forbidden Planet and learn that this collective id thing can be really dangerous. Then shut down our computers and go have a drink with some friends.” Well said, Charlie. Denise plans to share the best ideas and suggestions she’s received about how we as creatives and exhibitors can improve sales and our Con experiences from the many who commented on her blog, ComicBookWife.com, so watch for that. Through an agreement with Lucasfilm, I am able to sell my remaining unsold prints from SWCVI. I have approximately 30 prints available and I am happy to announce I can now offer them to those who could not attend the show in person. Additionally, I wanted to update everyone that I will be attending Cincinnati Comic Expo in less than two weeks – from September 22-23. I want to shout out a special thanks to our friend Kevin Dugan, who made us aware of this convention. 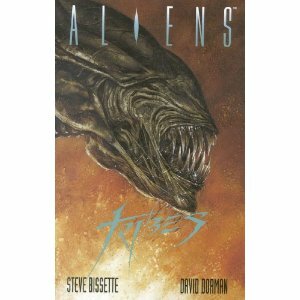 The headline to this story is that Stephen Bissette and I will reunite for the very first time since our Eisner and Bram Stoker Award-winning book, “ALIENS: TRIBES.”Stephen and I will do a panel on that book, which was revolutionary for graphic novel publishing, and still holds up today. Additionally, Stephen Bissette was my classmate and fellow “Kubie” at The Joe Kubert School of Comic and Graphic Art, so he and I will do a panel on our fond remembrances and appreciation of Joe Kubert. 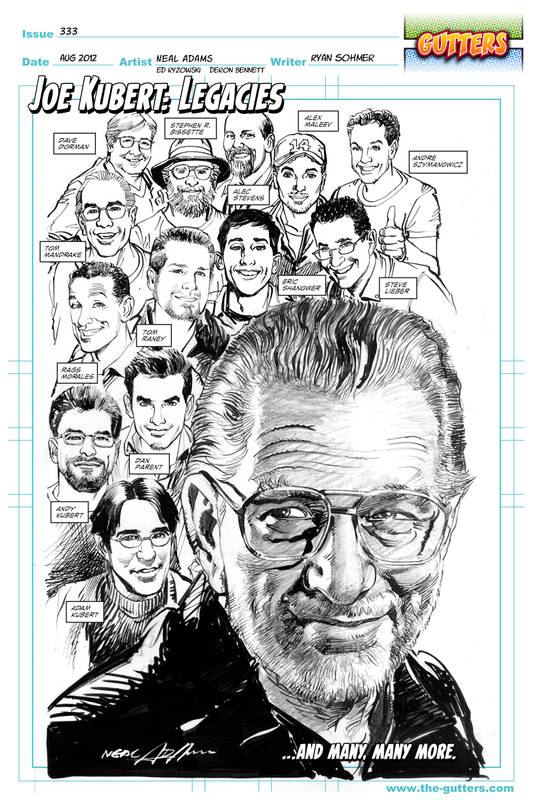 Here is the tribute art that Neal Adams did of Joe Kubert’s graduates – I was honored to be in the piece, and Stephen Bissette stands beside me. Jan Duursema and Tom Mandrake were also in our class. I was saddened to see a lot of “trolls” disrespecting Joe Kubert, his students, and his school on Stephen’s blog, and we will address those controversial comments as well. I can assure you that Joe Kubert always thought of his students first, as was evidenced when he cut me loose during my first portfolio review; Joe felt that I had “graduated” in terms of what I could learn there. I wanted to learn to paint covers, and since I attended during their second year of operation, they weren’t set up to teach me color work. Joe could have continued to collect tuition from me, but Joe Kubert put me and my career needs first, ahead of the much-needed tuition in the early days. (I also want to mention that Stephen Bissette is also reuniting with his “Swamp Thing” collaborators for the first time during a panel at Cincinnati Comic Expo, so attendees may want to see that as well). In other news, I’m assistant coaching my young son’s flag football team, and that has been a lot of fun. Many of you know that football was my sport at Friendly, MD high school in the late ’70s; I played defensive end in my junior year on the team that won the state championship, the first in our history. Those were heady times, fondly remembered. On October 6th at 2 p.m., I will be signing at the Barnes & Noble in West Dundee, IL, helping the patrons celebrate STAR WARS DAY. If you live in the Chicagoland/Northern Illinois area, I hope you can come out and join us. On October 26 – 28, I will be exhibiting at Geek Media Expo in Franklin, Tennessee and I hope that those of you who live in the area can come out and see me. While you’re there, be sure to check out my friend Leonardo Ramirez’ steampunk children’s book, “JUPITER CHRONICLES.” Joining us will be Michael Koske, my wife Denise’s client, who is a “walker” or zombie on AMC TV’s WALKING DEAD series. Michael is in the brotherhood we know as the 501st, and we look forward to seeing him again after Star Wars Celebration VI. That’s all the news for today. I thank you for your time, interest and support.